I'm a newbie at EMSA and am trying to get this to work for me. So I carry out my reaction, load &run the gel and the stain it with ethidium bromide in order to stain the DNA. However, as in the attached picture, I'm getting smears and this is seen in the no DNA control as well. Can anyone help answer why a lane which contains only protein is being stained by EtBr? 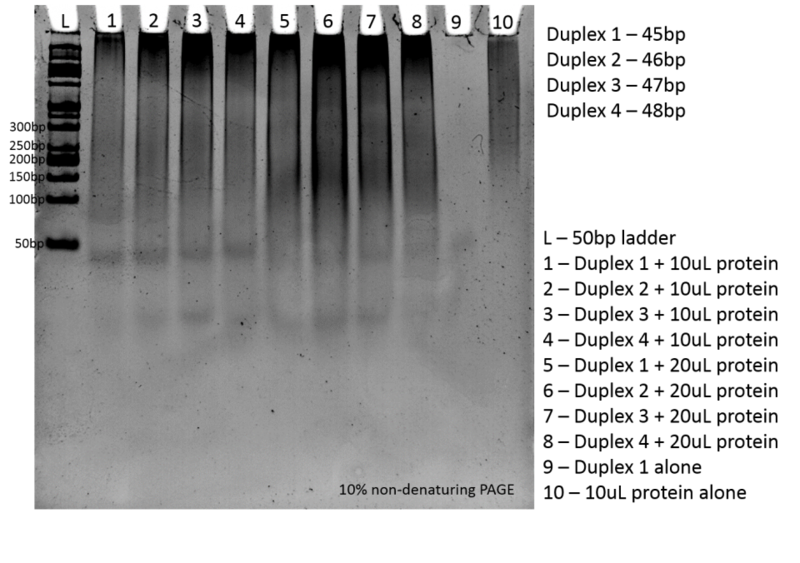 I've run the protein on an SDS-PAGE followed by colloidal coomassie staining and I see no degradation of the protein. presumably, the protein binds dna. you could be seeing dna carried by the protein or dna from dust or other contaminant. Where does the protein come from? If this is produced in bacteria, you may have co-purified bacterial genomic DNA together with your protein. nice paper, neuron. the only problem is that the paper says staining requires sds, however, the gel used in emsa does not use sds.